SOUTHERN OCEAN, January 10, 2011 (ENS) – Three Sea Shepherd ships have been fighting a running battle with the four-ship Japanese whaling fleet in the Southern Ocean near Antarctica for the past 12 days. But Sea Shepherd founder Captain Paul Watson denies the Japanese claim that Sea Shepherd activists threw “flash bang” grenades. “The Sea Shepherd Conservation Society does not have possession of flash bang grenades nor have we ever had possession of such weapons,” Watson said Sunday after a skirmish with the Japanese harpoon-hunter vessel Yushin Maru No. 2. 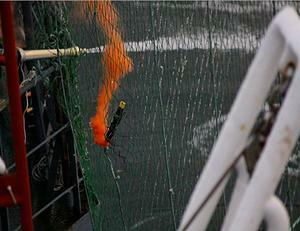 “Also, the activists put a hook and rope on the port-side handrail (where the protecting net is fixed) of the YS2. In addition, the zodiac activists deployed and dragged ropes aiming to entangle the propeller and rudder of the YS2,” said the Institute, which is based in Tokyo. “The object of this exercise was to attempt to throw the Yushin Maru No. 2 off the tail of the Bob Barker. 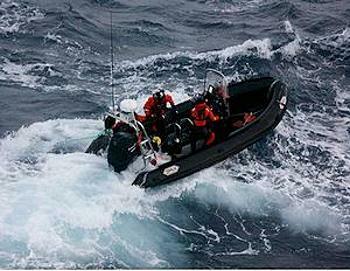 Sea Shepherd views the constant tailing of their vessels as a provocation to deter the Japanese whalers,” he said. No one was injured and no vessel was damaged in Sunday’s skirmish, both sides confirm, but a Sea Shepherd inflatable was disabled by pounding seas while on its way back to the Sea Shepherd ship Bob Barker over 80 miles of open sea. “The Bob Barker was forced to return to pick up their crew and ensure their safety,” said Watson. The other two Japanese vessels, the hunter-harpoon vessel the Yushin Maru No. 1 and the factory ship Nisshin Maru, have been running from the Sea Shepherd ships for days, covering some 1,400 miles in the first eight days of the year, leaving them no time to slow down and catch whales. The conservationists aim to keep the Japanese from catching whales, while the Japanese fleet attempts to catch a self-authorized quota of up to 935 minke whales and 10 fin whales. Watson said from the wheelhouse of the vessel Steve Irwin that he is confident the Japanese fleet can be kept on the run and on the defensive for the entire whaling season which ends in mid to late March. The weapons in this year’s whale wars are propeller-fouling ropes, stink bombs and smoke bombs on the conservationist side. The Japanese crews fire water cannon at the activists to keep them away. With these weapons, activists in inflatable boats sent from Sea Shepherd’s two larger ships, the Steve Irwin and the Bob Barker, are harassing the Japanese hunter-harpoon vessels the Yushin Maru Nos. 2 and 3. The two Japanese harpoon vessels have been tailing the conservationists’ since December 31, 2010 to keep them under surveillance and report their movements to Japanese authorities. For the first time this year, the conservationists are using high altitude weather balloons with attached cameras and radar detection capabilities. This technology allows them to keep tabs on the Japanese factory ship, the Nisshin Maru, from over 150 miles away. 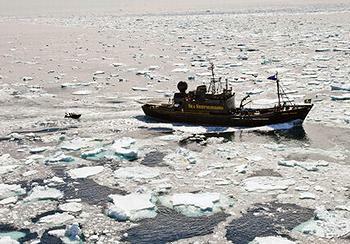 The ice-bound Ross Sea is beginning to open up in the warmer austral summer weather, and Watson says Sea Shepherd is watching the narrow opening to see if the Nisshin Maru, attempts to slip through. Watson’s strategy is to keep the Japanese whalers on the run trying to stay ahead of Sea Shepherd’s fast trimaran, the Gojira and its Nancy Burnet helicopter. As long as the harpooners continue tailing the conservationists, they will prevent Sea Shepherd from closing in on the factory ship Nisshin Maru, but the Sea Shepherd will be able to keep these two vessels from catching any whales. Australian Prime Minister Julia Gillard today warned against irresponsible behavior in the Southern Ocean and said Sea Shepherd should not expect help from the Australian government if activists get into trouble. Watson said the Sea Shepherd vessels carry physicians, trained medics, and firemen, and have well-stocked medical wards. The ships carry emergency pumps, firefighting equipment, and towing equipment. Before the Steve Irwin left port in December, the Australian Maritime Safety Authority notified Sea Shepherd that Sea Shepherd’s crews were not to expect any assistance, and the Australian Department of Foreign Affairs notified all our Australian crewmembers that the government would be limited in its capacity to help with consular services. In January 2008, the Australian government sent an Australian Customs vessel to rescue two Sea Shepherd activists who boarded the Japanese Yushin Maru No. 2 on Watson’s orders to deliver a letter to its captain demanding a halt to Japanese whaling in the Southern Ocean. 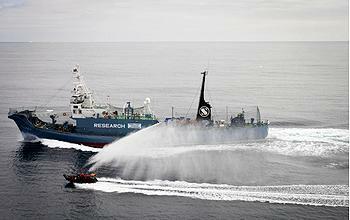 Australia sent the customs vessel at the request of the Japanese and with the acceptance of the Sea Shepherd. In 2008, an Australian federal court ruled that Japanese whaling in the Australian Whale Sanctuary is illegal and ordered the Japanese to stop killing whales within 200 nautical miles of Australia’s Antarctic territory.